Choosing the right groom wear is a delicate matter too, mainly because of the color of their outfit. Many grooms or brides (if women will be picking these clothing items too) have a difficulty in deciding over this topic. But, you should worry no more, because our pieces of advice and our tips will definitely help you make the right decision. 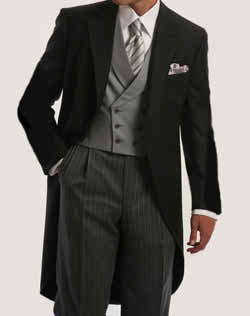 The most popular choice lately has been the black groom tuxedo. And if you wonder why; well the answer is simple: black is and has always been considered an elegant shade. Men in black have always been considered elegantly dangerous, sophisticated and stylish. And if this is how you would like to be characterized like, at your nuptials, then you would better have a black groom tuxedo. Mostly in casual weddings, such as beach wedding ceremonies, the bride and the groom, but their guests also, don all white outfits. If this is what you are going to have at your wedding, then you would better look for your casual yet nice white apparel. 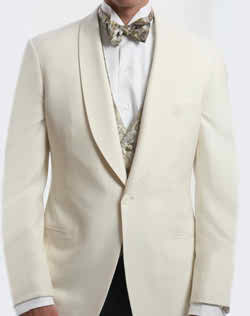 But, a white tuxedo is not common only in casual weddings. 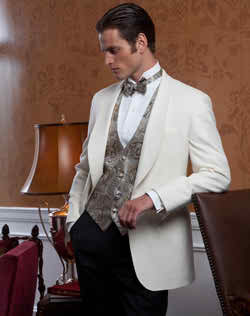 It is not something peculiar for a groom to wear a white tuxedo at his extremely formal nuptials. On the contrary, this is considered something very clean, beautiful and fresh, qualities that are very much appreciated. However, you do have a third option. If you believe that it would be something great for you thane you may have a black and white groom tuxedo. This would imply for you to pick a pair of black and elegant pants, next to a beautiful white jacket. Such a combination would look extremely glamorous, especially of your wife to be would wear a black and white dress. However, you should not consider this an important criterion. Just wear this black and white ensemble if you believe this would flatter and suit your perfectly. So, if you believed that the choice of colors is something that would concern only the ladies, it turns out that this matter is something that affects gentlemen too. However, we have exposed your options, and now according to your reasons, preferences and style of your wedding you will have to make the perfect choice.